I was contacted by a lovely customer who was after a sunshine pendant similar to my Rain or Shine necklace, and also an emerald set flower necklace. I made these flowers a while ago now, but I've been too busy with shiny things to put them up on the website yet. Must do that soon! I've not done any stone setting for a couple of months - it's always the scariest part of finishing a piece of jewellery. 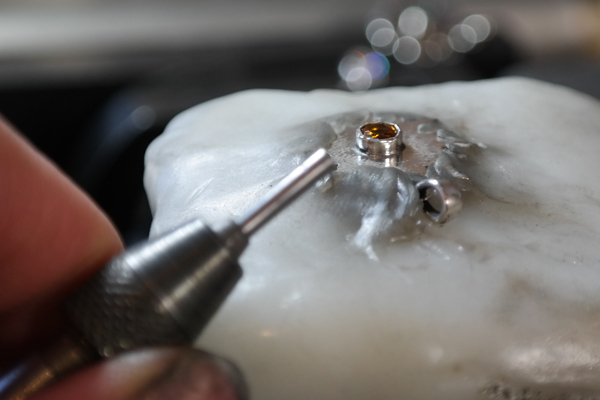 It's the last thing that needs to be done, but the easiest thing to get wrong, as stone setting requires a rather stressful combination of delicacy, precision and brute force! The stone setting course I did remains one of my best investments to date. Together with my Benchmate and polymorph to hold the piece in place, it's now a less stressful experience!